HÀ NỘI — The Hà Nội Association of Young Blood Donors has collected nearly 500,000 units of blood to help save thousands of lives over the past 25 years. 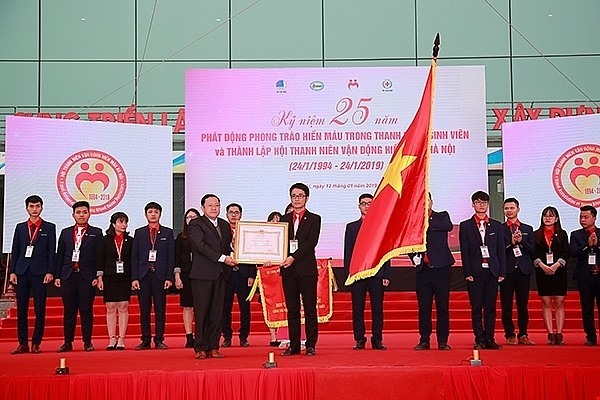 A meeting in Hà Nội celebrated the 25th anniversary of the launch of the blood donation movement for young people and students in the capital city and the establishment of the Hà Nội Association of Young Blood Donors on Saturday. At the event, the association president Chử Nhất Hợp said that the Hà Nội Association of Young Blood Donors, as a force uniting young people and students, has played a key role in the blood donation movement. “Since its establishment, the association has played an important role and position in ensuring blood transfusion in Hà Nội as well as of the National Institute of Hematology and Blood Transfusion (NIHBT),” said NIHBT director Bạch Quốc Khánh. “On January 24, 1994, the first ever blood donation event was organised successfully in Hà Nội by the NIHBT and the Hà Nội Youth Union, marking an important foundation for the expansion of the blood donation mobilisation movement across all corners of the country in following years,” said Khánh. Khánh said that from that difficult start, the country developed a voluntary blood donation movement. The amount of blood collected has risen consistently each year. In 1994, Việt Nam received 138,000 units of blood, of which 15 per cent came from voluntary blood donors. In 2018, the country received 1.4 million units of blood and 98 per cent of them were donated by voluntary blood donors, meeting more than 70 per cent of the country’s blood demand for emergency and treatment, according to NIHBT. To date, Việt Nam has formed a blood transfusion network that operates closely with the health sector and the Steering Committee for Voluntary Blood Donation Mobilisation at all levels and agencies and organisations. In all regions of the country, youth union members, youngster and students are always the core force, actively participating in blood donation festivals and mobilising people to voluntarily donate blood. Many models of voluntary blood donation were established and expanded successful to many provinces and cities nationwide, according to the health sector.